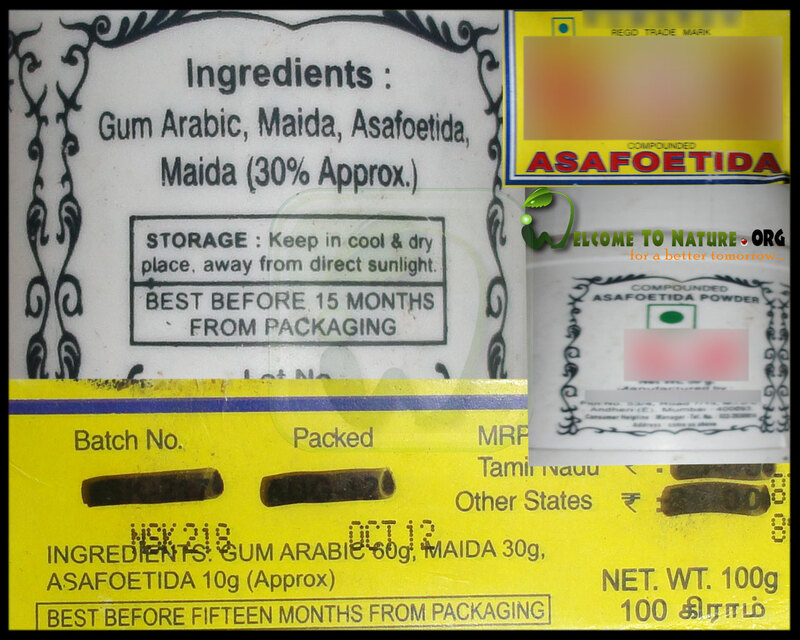 Home / Articles / Adulteration / The Real Facts About Asafoetida, How they are cheating public? The Asafoetida in your hand is not original asafoetida. It actually contains gum (gum arabic) and maida. It is written on the packet itself. It contains less than 10% of asafetida. Also the flavor of asafoetida is added in it. How many of you know this? What will be our health condition if we include this type of asafoetida in our daily diet? What else will happen, we itself and the people around us are tolerating its outcome. Asafoetida is one of the main ingredients in Indian cuisine. It is used in sambar,rasam and also in other curries to increase the taste. Also it has medicinal values. But, what if we use asafoetida that is made of maida? Now there is no need to tell how all these diseases occurs. Maida is the last product of wheat. It is a waste that is got after taking all the fiber from wheat. It is whitened using benzoyl peroxide and a chemical named alloxan is used to soften it. Also when maida is whitened using benzoyl peroxide, i.e. ; during the bleaching process alloxan is produced. Alloxan is the real star. Alloxan is a chemical that is used to create diabetes in animals to test the medicines for diabetes. That means the one who eats alloxan daily can expect diabetes in future because, alloxan can destroy one’s pancreas. It has the power to kill a human by destroying the beta cells of his pancreas. Not only that, it has the ability to make a human Type-2 diabetic by destroying his ability to produce insulin. Isn’t that enough for asafoetida? Let me include that this maida is banned in China and European Union. Not yet finished. Don’t you need to know about Gum Arabic? This is a gum got from two types of acacia tree. This is mostly used in printing press, paint production, glue, cosmetics, industrial application, textile industry and shoe polish. Do you know what the price of real asafoetida is? The current rate is more than Rs.5200. Do we need this adulterated product?